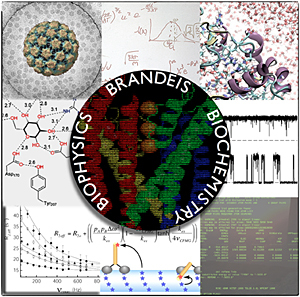 The Graduate Program in Biochemistry and Biophysics offers advanced education in the principles and practice of macromolecular chemistry, mechanism, and structure. All aspects of this program are aimed at the question: how do macromolecules work? How do proteins, membranes, nucleic acids, membrane assemblies, and high-order complexes of these enormous molecules use physical-chemical principles to act in the varied contexts that underlie biological function? Faculty participating in this program share the conviction that the coherent operation of living cells, and its disruption in disease, is ultimately understandable in terms of the chemistry and physics of biological macromolecules. An interactive, informal spirit pervades the Life Science programs at Brandeis. Students may choose research labs from all Life Science faculty regardless of departmental affiliation. Since most research groups are small, faculty members maintain close interactions with students, and collaborations among laboratories are common. Students may also opt to supplement their training by participating in the Quantitative Biology program. All Biochemistry and Biophysics Ph.D. students are fully supported with tuition waiver, health insurance support, and a monthly living stipend.